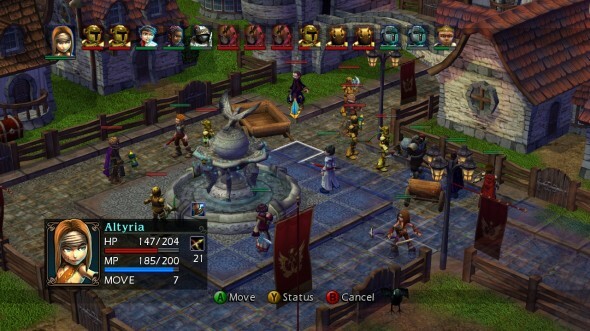 I am a big fan of Strategy RPGs, in fact my favorite game just so happens to be one. SRPGs just seem to have a way of offering me all the things that I want. I get a lot of joy out of creating a fighting force that is customized to my specifications. Creating a long term plan for what I want my team to look like and then gradually seeing that come to fruition is really fun to me. So when I heard about Vandal Hearts: Flames of Judgement, a game that was suggested to me because ever character's stats and proficiencies are directly tied to your actions, I was instantly interested. Of course it's a $15 game from 3 years ago, but I just recently got around to playing through it. Having beaten the game, I thought it was worth taking a look at what it did right and... everything else. So what does it get right? The first thing that comes to mind is that the battles are all pretty varied. There are a fair number of them for such a cheap game, and very few of them feature the simplistic "kill all enemies / the boss" objective. Even the missions that do have you simply murdering all the baddies almost always have something else to spice things up, often some object on the map that can be interacted with. This can mean a boulder you have to push down a hill, or a flaming brazier you can shove over to block off a path, or a variety of other things. Between those, and all of the treasures scattered across each map, every battle stays pretty fresh. Beyond that, the only other positive thing I can really say about the game is that it's stat system really is quite extensive, offering a ton of potential customization to each character. However... it's not so simple as that. The unfortunate fact of the matter is that Flames of Judgement is a game with a list of issues a mile long, a list that I couldn't possibly sum up in this post. But ultimately, most of the big issues end up relating back to the stat system in some way. Which is unfortunate, because I've always really liked the whole "your stats grow based on your actions" kind of systems. I think the issue Vandal Hearts: Flames of Judgement faces however is that it just went way overboard. At a guess, I would say that each of your 6 characters have something like 45-50 stats. These include your core stats, your combat stats, your weapon proficiencies and your magic proficiencies. Many of them make perfect sense and are no surprise. Sure, you get better at using swords the more you use them, and melee attacks while your at it. Sure, your MP and magic stats go up the more you cast spells. 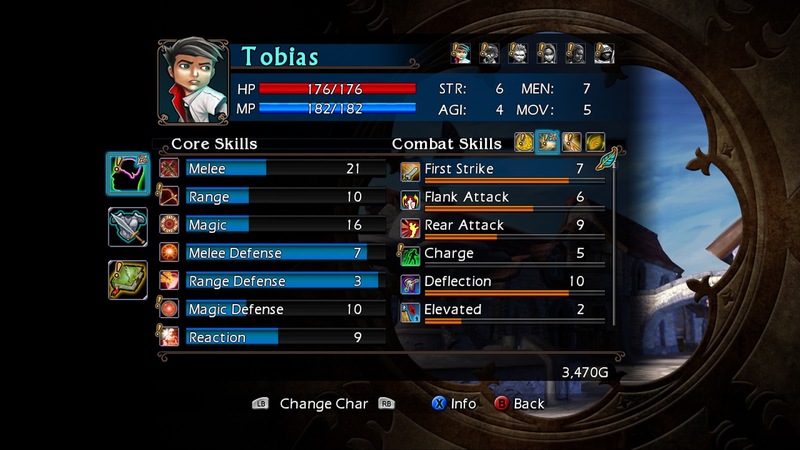 The combat stats are just silly though. Why do we need a stat the indicates how much damage you do when you move more than 3 squares before attacking? Or when attacking from a higher elevation? More to the point, why do we need to care about these stats increasing? As I said, the overwhelming depth of this system ends up causing several issues. For me though, I think what really killed it for me was the fact that, each character has so many stats it's hard to get a good impression of how strong they currently are, and how they are progressing. There is no one screen you can look at and see "oh, he has 12 strength, that's pretty good". In fact, each character has a strength, mentality and agility stat, but as far as I can tell they don't actually do anything but indicate the suggested route the player should guide that character along. These stats never change, and within a couple hours of starting the game the character with the second lowest strength was my best physical attacker. Now this may seem like a small issue, but I believe that in a game such as Vandal Hearts, progression is everything. If you can't get a good idea where your characters stand, then your system has failed. These systems work when you have a good idea where you want your character to go, how to get there, and how far along that path you currently are. Vandal Hearts: Flames of Judgement fails to varying degrees in all three areas. The other big issue to me was simply the game's usability and just the general feel of it. Just about every aspect of the game feels obtuse and lackluster in some way. Sure, I can understand if a $15 title uses still images for it's story scenes. But I don't understand why it takes as long to load some static images as other games take to load entire 3D cities. Why is it that the only time I can save is when in camp, but I have no ability to enter the camp menu myself? Do I really have to fight and win a battle just to save the game? Easily the worst offender in this regard is the game's inventory menu. It's understandable to some degree that it's hard to display so many stats, but it really wouldn't have been that hard to make a more usable menu system. To do just about anything requires you to scroll to a tab within a tab within a tab, then scroll all the way down a menu. Heck, I didn't even know how to equip items until 1/3 of the way into the game because the equipment screen requires you to scroll down to a second screen, but offers no indication that you can do so. In the end of the day, Vandal Hearts: Flames of Judgement is a game that exudes mediocrity from every pore. I could spend all day typing and still not list every minor issue I take with the game. You'll notice I didn't even mention the game's plot or it's characters, but I've detailed the most offensive issues here. Ultimately it's a game that is at it's best mildly interesting, and at it's worst an obtuse sack of annoying. Much of that is forgivable in a $15 title, but the most grievous issues plaguing the game are as a result of bad decisions and bad design, not because of a lack of budget. I'm glad that I did play the game, however. It's games like Flames of Judgement that we learn the most from - games with a few interesting ideas followed by a massive list of things not to do. With that said though, I wouldn't recommend it if you are looking to y'know, have fun with your video game.